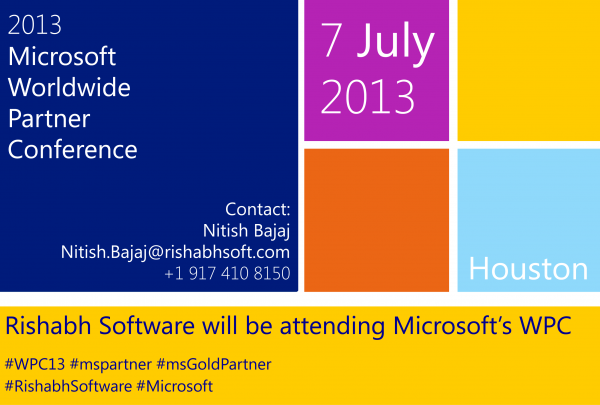 The Microsoft Worldwide Partner Conference 2012 starts this Sunday on the 8th of July, 2012. This 5-day event, held in Toronto this year, is expected to bring together more than 15,000 attendees from 150+ countries under one roof. This creates the perfect environment for businesses to share best practices and development mutually beneficial collaborations. With Microsoft executives sharing their vision of the future and showcasing Microsoft’s road-map for the coming year, it is a great opportunity to learn about the latest innovations and growing your business. Microsoft Dynamics track(with an emphasis on CRM): Given the highly anticipated Q2 2012 release of Dynamics CRM right around the corner, we are interested in the first look of the product across the various platforms ranging from the iPad to the Mozilla browser, making Dynamics CRM a truly multi-platform solution. Enterprise Track: Topics in the track that interest us include Partners Opportunities with Azure as well as with Sharepoint, as Rishabh Software offers integration services to Enterprises in both. Future of Productivity: With the purchase of Yammer by Microsoft, Microsoft seems to have strengthened their push into the future of collaboration and productivity. We look forward to seeing how Office365 (Microsoft Office in the cloud) and other productivity and collaboration platforms will converge to make sure enterprises get their ROI. Windows Phone: And of-course, last but not least, Microsoft’s mobile strategy will also be worth a look as the current situation doesn’t seem to favor the Windows Phone platform. As software developers, we need to be sure of the technology road-map for the platform in order for us to invest valuable time to develop expertise. This is definitely something on our radar. We wish all the other partners tremendous success at the conference and we hope to see you there. If you want to meet Rishabh Software for potential opportunities to work together, reach out to our VP – Saumil Shah through WPC Connect or send us a mail on [email protected] and we’ll set up a meeting. Good luck!